Coming out of the French club music scene of the late 1990’s, Daft Punk have always set the standard for electronic music across the board. With the release of Random Access Memories, they have yet again proven just how versatile yet relevant their musical style can be. Blending past, modern and future sounds together is no easy task for any group, yet Daft Punk pulls the stunt off with ease. It’s difficult to say whether Random Access Memories is the most quintessentially Daft Punk album so far or the most unusual. Their first album Homework, released in 1997, featured a lot of electronic, drum n’ bass sounds, mixed with rock guitar influences. Random Access Memories still makes use of their trademark synthesizer sounds and distorted voices, but this time around it’s so much funkier than previously heard. As a matter of fact, a lot of the album sounds like a lot of the funk acts from the seventies. Defining moments such as their single “Get Lucky,” a song that has so little of their original electronic sound apart from the hallmark distorted vocals, make it sound more like an album from the disco era in American music than a modern electronic album. Taking it in that context alone however, their use of funk guitar and drumbeats surpasses many of the seventies acts easily. This combination of sounds blends together expertly. The album isn’t as exciting and energetic as some past works, but the sound is well-crafted and it’s all very easy on the ears. Modern electronic music can be very purist, using little or no sound from stringed instruments or otherwise. 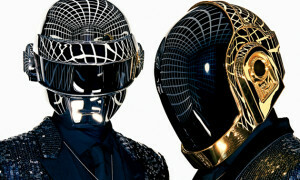 With contemporary acts such Skrillex, Deadmau5 or Wolfgang Gartner ruling much of the stage with music that primarily uses mixing and sampling, Daft Punk’s move to rely increasingly on traditional musical instruments is a one bold.